Hello, everyone I am new to this forum. I would like to let everyone know about a really good engine option. 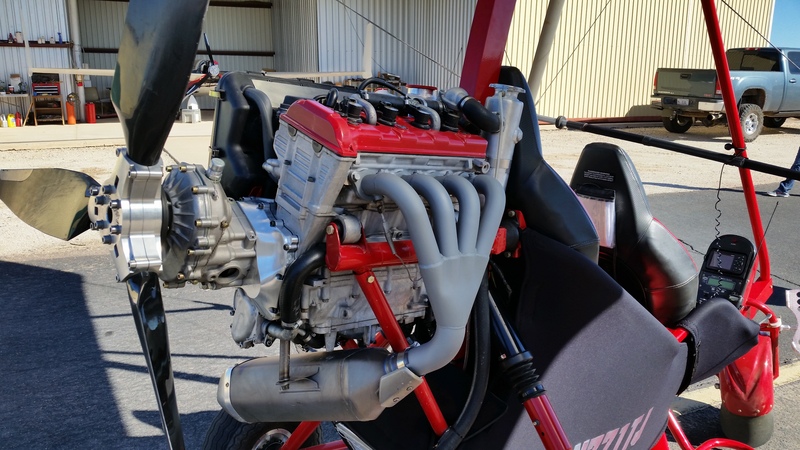 I have been using the RX-1 engines now to power my last 3 aircraft which have been trikes. I am a machinist by trade so I made a adapter that will allow the use of a rotax C gearbox with this engine. I recently bought a Kitfox model 4 that is currently being powered by a 912. I will be removing the engine and replacing it with the RX1. The engine weigh 128 lbs bare. they are 140 lbs with carbs gearbox and adapter. They up to 140 HP stock. 4 cylinder double overhead cams 5 valves per cylinder. They are super reliable with the snowmobile community. See my you tube video of me installing a adapter on a RX1 under SKYTRAX YAMAHA. Steve Henry of wild west aircraft is currently installing one in his new highlander. Teal, Welcome to the forum. Keep posting about the RX1 - I think you will have a lot of attention, and probably questions from members here. Photos, flying reports, etc. are always great info. Wishing the best to you. What does this engine cost? What will you charge for adapters? What are the hp options? The reason for using the RX-1 for me was that it has a output shafts drive cover that could be removed and directly replaced by my replacement adapter cover so it is a real clean conversion. It is the same weight as the 3 cyl. Or within a couple pounds because the 4 cyl. Has a lighter crank shaft and has no counter balance shaft. It runs really smooth. The 3 cyl does not have any good provisions for mounting a gearbox and after you add mounting plates and hardware it will definetly be heavier than the rx1. Plus the RX1 has 20 more hp. What kind of rpms does this engine run on? Best redrive ratio? Also, see above questions in my post. If I had a 2-stroke engine I would be seriously looking at this one. Welcome and thanks for posting! I have been following Steves install fairly closely. How do the trikes do in comparison to a ULS? 1) The adapter kit is $1500 and includes the adapter and hardware to mount a C gearbox. 2)The cost engines just depends. I have found that it is best to find low mileage good shape snowmobiles and buy them complete. They sell for $3000-$4000. I personally have bought some for $1800. 3) So another question that hasn't appeared here but I would like to hit on is complete cost for a FWF package one will be into one of these engines. Now I'm not offering packages since I do not have a business nor the time to offer this kind of service I am just offering my experience with the cost so someone can make a better educated decision on whether this engine is right for them. $1500 for adapter kit, $3500 for snowmobile, $1600 for new Rotax C gearbox plus say $1000 for nice AN fittings, Bottles, radiator etc. So your at a conservative $7600 for a 140hp engine package. Now for a lot of people this will come cheaper for instance they already have a used gearbox or they find a sled locally for $1800. For many it may make more sense to keep a look out for the used 912 for around that price. For me I love having a modern 4 stroke that has more HP and is cheaper to maintain and buy parts easier. 5) I have done lots of thrust measuring. I have pulled pretty regularly 530lbs. I have pulled 570 lbs with the prince P tip 74". and the 3.47 rotax gearbox. I do believe there is more to be had since it sounded like the prop was cavitating. in comparison my 912UL kitfox pulls 320lbs and my buddys STOL plane with a 160 hp 0-320 Lycoming pulls 590lbs all pulls on the same day. Oh and as far as flying a trike with the 912uls and the RX1, You can feel the acceleration and take off performance increase but trike's can not use that much power unless you have a really fast wing. So you end up not holding the throttle very long because you end up heading straight up in the air. Its a lot of fun but I look forward to seeing how fast it will launch a kitfox off the ground. Thanks for bringing simple innovation to us. You spent a ton of time on the phone with me, and as a small buisness owner, I know how hard that is to do with every looky loo. Suffice it to say, that if any one of my fellow Avid owners is considering this engine upgrade, know that you're in good hands with regards to coustomer service and Teal. He's the real deal and is just like one of us. Teal, I've considered this combo for my Zenith 701 project. My only concern is how to cowl this engine for my application. Im pretty sure a stock Zenith cowl will not work for this engine with as much off set at it has. I'm just going by looks and wonder if you can tell me what the off set is from center of the prop hub to the top of the engine. Also can you tell me what and how you plan on addressing this issue on your Kitfox. I see the Highlander is using it and wonder how they will fit a cowl over it. So many good little small four stroke engine out there which have been slanted to fit under our cowls. I would appreciate any thought you might share. Very clean installation. Impressed with your workmanship and attention to detail. What kind of trike is that? I used to fly a Northwing a while back. Are you sure your not confusing the apex engine with rx1. The only limp mode I found was with throtle overide and that is easily bypassed. The gearbox is slanted to bring the center of the prop. To the center of mass and engine mounts. It's 9 inches from the center of hub top most of engine. If the gearbox was straight up it would only gain about 3/4 inch. My kitfox cowl is round and looks like it will fit just fine. I know somebody that was flying with a Geo engine, thought he would get better climb if he put less pitch in prop,more RPM, long story short, geo,s have a reve limiter, went into limp home mode, tree top landing!!! The way it sounds ED with the slanted gearbox the prop will be in the center of the plane. 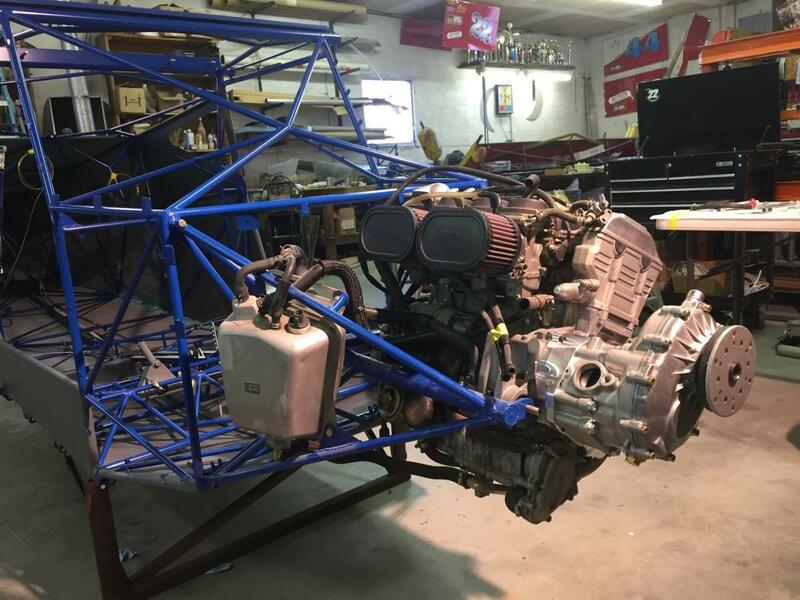 If he was to straiten out the gearbox that would place the prop off center, Im kind of pumped to see how this engine works, I think it will be sweet, Of course not as sweet as my Jabiru ha. Just wondering Teal, are you using the rk400 clutch setup on the Kitfox project?